Rutin is a flavonoid commonly found in many vegetables, fruits and other plant species. Thus, this study investigated the protective role of rutin on cognitive function and impairment of ectonucleotidase, monoamine oxidase (MAO) and antioxidant enzymes activities in the cortex and hippocampus of cadmium-induced rats. 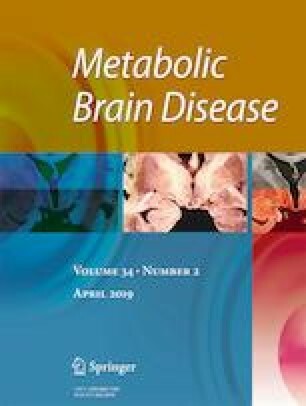 Cognitive impairment was induced by an oral administration of 5 mg/kg Cadmium chloride for 14 consecutive days. Rutin was dissolved in 2% dimethyl sulfoxide (DMSO) and administered orally at the doses of 25 and 50 mg/kg for 14 days. Thereafter, animals were divided into six groups (n = 6) as follows: control, rutin 25 mg/kg, rutin 50 mg/kg, cadmium, cadmium plus rutin 25 mg/kg, cadmium plus rutin 50 mg/kg. After treatment period of 14 days, animals were sacrificed and the brain was dissected into cortex and hippocampus. Results showed that cadmium caused a significant increase in ectonucleotidases, adenosine deaminase (ADA) and MAO activities, with a concomitant decrease in thiol levels and antioxidant enzymes activities. However, treatment with rutin decreased ectonucleotidase, ADA and MAO activities in cadmium-induced rats. In addition, rutin reduced residual level of cadmium ion in the brain of cadmium-induced rats. Conclusively, present findings revealed that rutin could prevent/restored the impairment of the enzymes that regulate the purinergic and monoaminergic extracellular signaling and restore antioxidant status in cognitive impairment caused by prolonged cadmium exposure.